Algeria and Morocco have sharply criticised the anti-Islam film that sparked deadly violence in North Africa, while also offering their condolences over the death of the US ambassador to Libya. Morocco described as "shameful aggression" the attack on the US consulate in the Libyan city of Benghazi, and presented its "sincere condolences" to the US government and people, while denouncing the film that prompted the attack. The Moroccan government stressed that the attack "cannot, in any case, be justified," in a statement carried by the official MAP news agency. 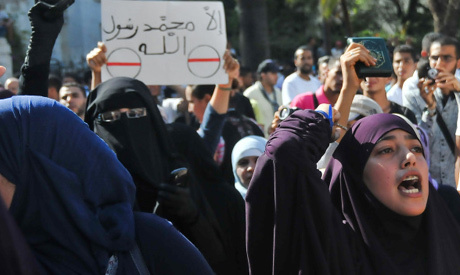 Algeria's foreign ministry, meanwhile, condemned the low-budget movie, "Innocence of Muslims," reportedly made by an Israeli-American, which portrays Muslims as immoral and gratuitously. The film sparked fury in Libya, where four Americans including the ambassador were killed on Tuesday when a mob attacked the US consulate in Benghazi, and has led to protests outside US missions in Morocco, Sudan, Egypt, Tunisia and Yemen. Algerian Foreign Minister Mourad Medelci offered his condolences to his US counterpart Hilary Clinton, after the deadly attack. Ministry spokesman Amar Belani meanwhile deplored "the irresponsibility of the authors of the film... which offends Islam and his prophet," cited by the official APS news agency. "The outrages on the sacred religious symbols... can only result in disapproval and indignation, because these provocations are designed to fuel hatred," he added. The US embassy in Algiers issued an emergency travel warning, urging US citizens to avoid large crowds, and to "be aware of the potential for protests or demonstrations at any time." In Morocco's largest city Casablanca, between 300 and 400 Muslim activists gathered outside the US consulate, amid a heavy police presence, some shouting anti-US slogans, including "Death to Obama!" On Thursday, Egyptian police used tear gas as they clashed with a stone-throwing crowd protesting outside the US embassy in Cairo, after 13 people were injured in overnight unrest, according to the health ministry. I am a 64 yr old California, USA male, and I think the film in discussion is garbage, but in our country, anyone can express their opinion. Islamics are not our enemy. Those who enslave and hate are. Don't be a hater. How terribly ignorant of Moroccan protestors to cry "Death to Obama". He is appalled, we are all appalled by this stupid film. Get over it. There are far more important things wrong in Morocco which need addressing.